The ATEX intrinsically safe version of the 5000 series pressure transducer features a sturdy ceramic diaphragm that detects minute pressure variations, while withstanding large pressure spikes. 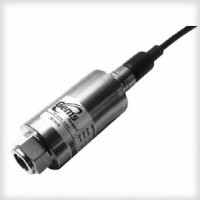 The tough ceramic sensor is housed in a stainless steel case to ensure performance in the most demanding applications. Both voltage and 4-20 mA outputs are available at time of order. A switch and potentiometer can be accessed for field adjustment of range with 3:1 ranging capability.